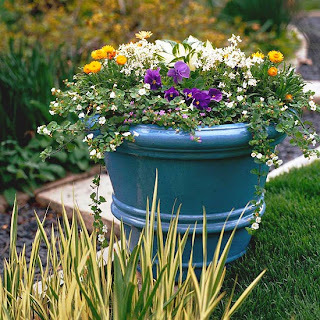 Cool-Season Containers ~ Fill your landscape with spring color with these fresh and easy container gardens. 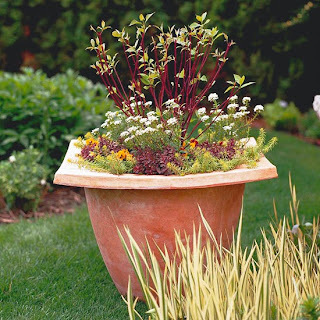 One well-planted container looks great on its own, but a grouping can be stunning. Here, a colorful mix of pansies, violas, lobelia, stock, and kale creates lots of interest. Use them by a doorway, next to a path, or to add cheer to bare spots in your spring garden. 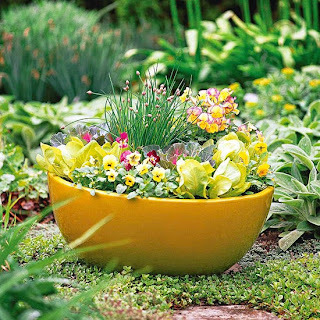 Hint: Use three different sizes of the same kind of container to give the arrangement a more put-together look. Use yellow to wake up your landscape once winter passes. Here, a golden container holds yellow primroses and 'Lemon Symphony' osteospermum. All that yellow contrasts beautifully with purple from 'Berries & Cream Sachet' nemesia, 'Caitlin's Giant' ajuga, and columbine. 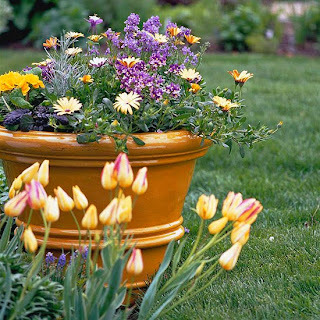 Hint: Echo the color of your house in your container garden, or use it to complement blooms from your yard for extra appeal. While it's easy to focus on ornamental favorites, edibles work just as well. A mix of spring greens will provide salads while looking great in the landscape. 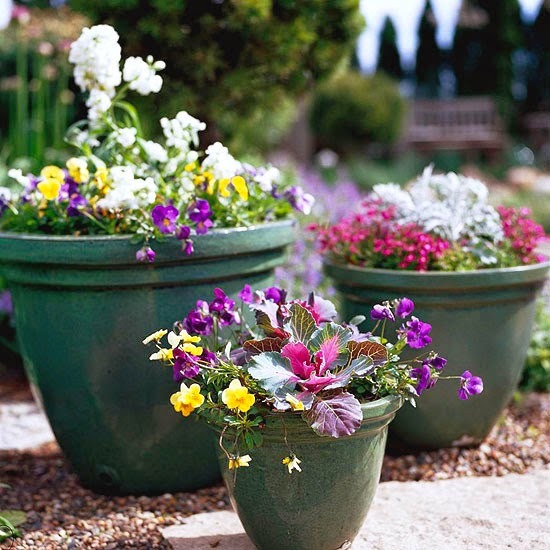 Accent both the container and your salads with the cheerful and tasty viola blooms. Here, chives tossed in the middle of the pot create a fun textural contrast. Hint: Try the full range of spring greens, including spinach, kale, and red, green, and bicolored lettuce. A gorgeous spring container garden doesn't have to be complicated. Here, a variety of pansies and violas add charm and color to a strawberry jar. Use a mix of colors for a flamboyant look, or limit your pansies to one color for a more elegant, soothing presentation. 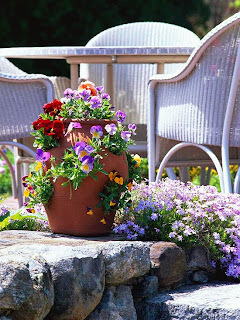 Hint: Once summer heat arrives and the pansies start to fade, replace them with herbs or small annuals that don't mind the warm weather. Bright colors are especially refreshing after a long, dull winter. 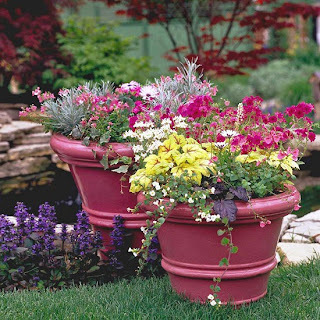 Here, bold pink containers feature favorites such as silvery licorice plant (Helichrysum 'Icicles'), pink 'Little Charmer' diascia, and 'Intensia Neon Pink' annual phlox, and the golden foliage of foamy bells (x Heucherella 'Stoplight'). Hint: When using bold containers, make sure your plants are dramatic enough to hold their own so they don't get overshadowed by the pots. The best container gardens don't just look good -- they smell great, too. 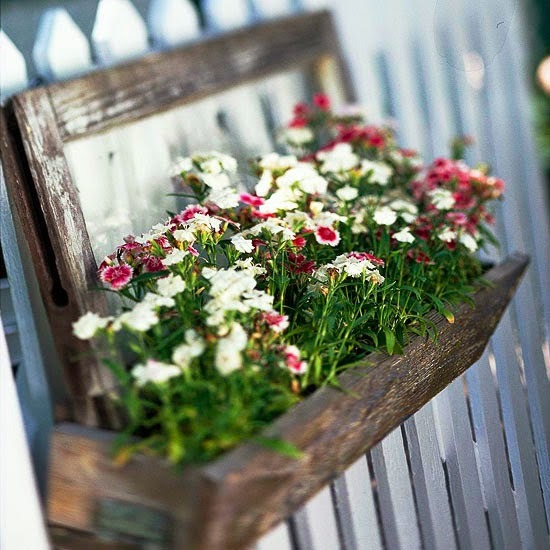 Incorporate a few fragrant plants into your containers and be sure to site them where you can enjoy them. For example, here dianthus hangs from a picket fence, bringing it that much closer to nose level. Hint: Keep in mind that not all fragrances mix well, so try putting the plants together at the nursery before bringing them home. We use them as architectural plants in the landscape, but shrubs can also lend flair to containers. Here, the ruby-red stems of redtwig dogwood (Cornus sericea) offer great contrast to the fresh-green leaves. The arrangement is made even more interesting with a couple of colorful sedums (purple 'Voodoo' and golden 'Angelina') and white candytuft. Hint: Young specimens of most shrubs should fit well in containers. But also consider dwarf shrubs such as 'My Monet' weigela , bearberry (Arctostaphylos uva-ursi), or 'Tom Thumb' cotoneaster. 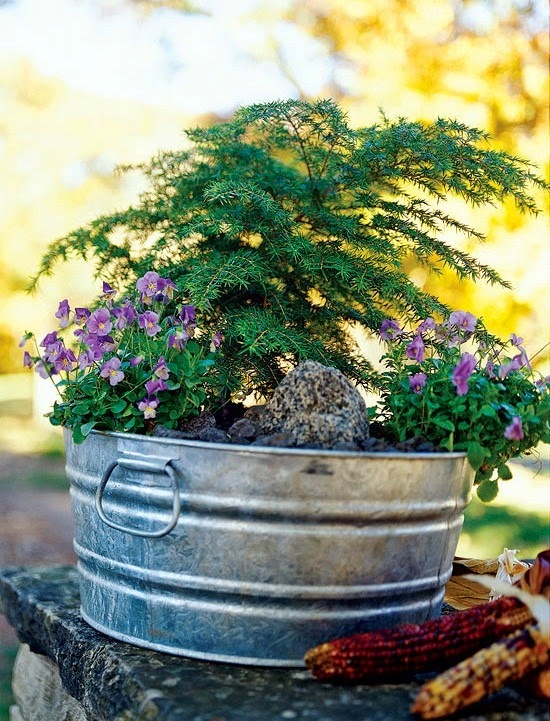 This easy container features a rugged dwarf hemlock (Tsuga canadensis) and a pair of lavender violas for a simple, soothing look. A mulch of coarse stones accented by a single larger rock helps create a natural scene in miniature. It's perfect for a partially shaded spot. 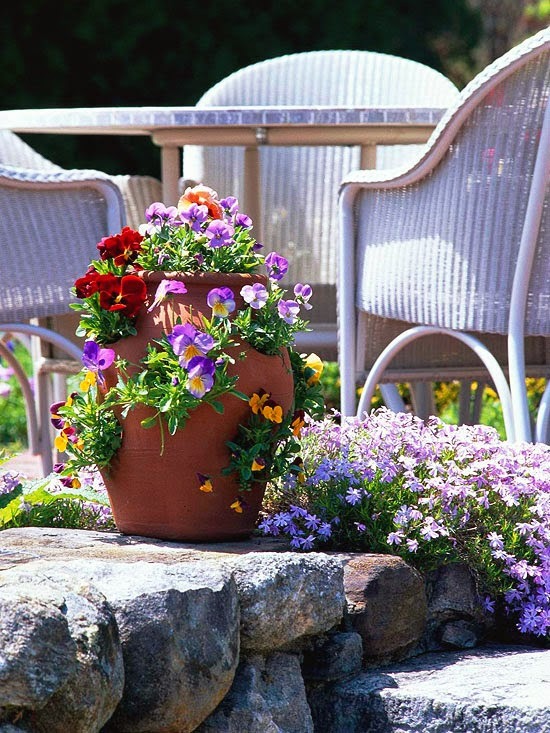 Hint: To keep this container looking good all seasons, pop out the violas when they start to fade and replace them with shade-loving impatiens, browallia, or wishbone flower. 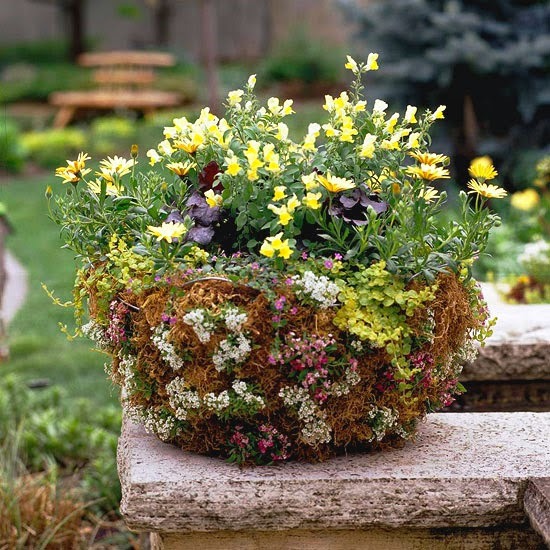 One great thing about spring is that moss-lined baskets and other containers don't dry out as fast -- so you don't have to water them as much. 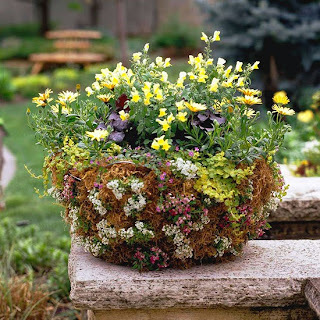 Here, a basket is filled with favorites including purple coralbells and yellow osteospermum and snapdragon. A mix of sweet alyssum and creeping Jenny cascades down the sides. As they get going, they'll eventually cover up the moss. Hint: Other trailing plants for spring include lobelia, diascia, and bacopa (Sutera). 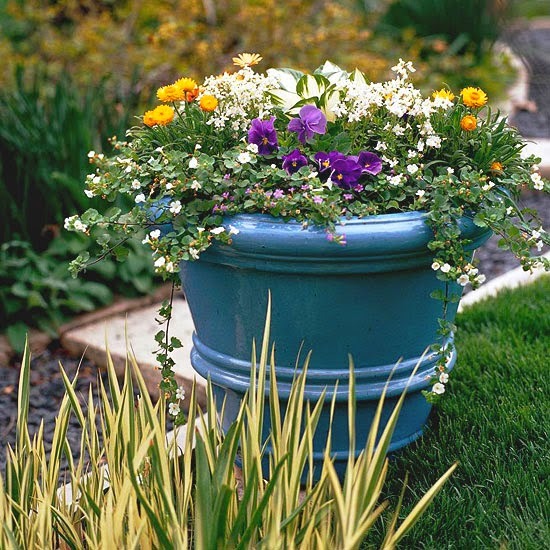 Don't be afraid to incorporate perennials into your spring containers. Then plant the perennials in your garden once the annuals start to fade. Here, for example, bacopa, purple pansy, white nemesia, and yellow strawflower mix well with 'Fire and Ice' hosta. Hint: Growing hostas and other perennials in tall containers can help protect them from hungry rabbits early in the season.